In early 2012 Azam and Barbara Gill started an adult literacy class in Rawat (PAK05), a suburb on the outskirts of Islamabad. They did this because they discovered that very few men were able to read. Many of the Christians have to leave school before they become literate and so life becomes a real struggle for them. They started an adult literacy class and found that the people very quickly caught on to reading in both Urdu and English. Azam comes from a village near to the city of Faisalabad and travels back there from time to time to deal with family matters. In mid 2012 they returned to their village for a funeral and while there discovered that most of the people in the churches in that area could not read. This was having widespread consequences in these rural communities, especially for the young people as the older people did not encourage them to become educated. Azam and Barbara decided they wanted to do something about it in this rural area. They found a person who was also concerned about this issue and have decided to commence adult literacy classes in three villages adjacent to the city of Faisalabad. Each village will have a key teacher. They will be focusing just on teaching reading in Urdu as there is little need for English in the villages. The project will be aimed at Christians first as initially they want to empower them, and then to the wider Moslem community. The teachers will be Christians. Most people will require a two year programme of teaching. For a number of years, Azam and Barbara have been concerned about the lack of education amongst the poor in Islamabad. Barbara has started a school and a number of training courses have been initiated to teach women how to sew. The sewing training has been very effective and most of those who have been trained are contributing to their family income. BHW has had a relationship with Azam Gill since 2002 after our Field Director met him at an international conference. In 2012 we commenced funding of an adult literacy class in Rawat as a pilot scheme as the Christian men in the community were desperate to learn to read and write. Following a visit to Pakistan by BHW's Field Director in February 2013 where the positive impact of the adult literacy class in Rawat was very evident, it was decided to expand these classes out to the three rural villages near Faisalabad. The beneficiaries of this programme will be the men and women in the three villages adjacent to Faisalabad who cannot read. The initial group will be those from the church and when the pilot class has been finished, it will be opened to the whole community. In some cases whole families are attending these classes. These classes are also assisting the teachers and their families by paying them a regular salary. They have the training / teaching resources through the school Barbara is developing in Islamabad (PAK06). They have a key person on the ground in the area. They are already successfully running an adult literacy class in Rawat which they see as a pilot for other classes. A teacher will be hired in each of the three villages to run the literacy classes. 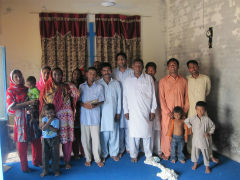 The vision is to develop a programme that teaches adults, particularly poverty stricken Christian adults, to learn to read and write so they can participate in Pakistani community, obtain decent jobs, earn a reasonable income and value education which will stop them taking their children out of school before they are educated. The participants will be taught to read and write in Urdu initially.